Following the tremendous success of the DCI Fan Network which made its debut during the 2008 DCI Summer Tour, Drum Corps International, the world leader in producing and sanctioning marching music events, has partnered with Music For All and Mr. Video Productions to create the Bands of America (BOA) Fan Network. The Bands of America division of Music for All presents more than 20 music education events annually, including 17 Regional Marching Band Championships in the fall, the Grand National Championships, November 12-15 in the new Lucas Oil Stadium in Indianapolis, the Music for All National Festival and the Music for All Summer Symposium. 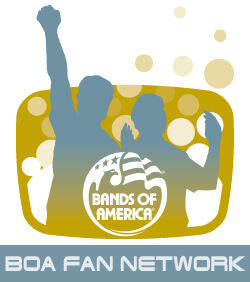 Created on the same proprietary technological platform as the popular DCI Fan Network, the BOA Fan Network will give marching band enthusiasts access to an abundance of media-rich content including live Webcasts from the organization's "Super Regionals" and Grand Nationals, and recorded OnDemand Video from those and other select events. "We're pleased to enter into this creative collaboration with Music for All," said John DeNovi, director of business development for Drum Corps International. "With the creation of the BOA Fan Network, marching music fans from around the world will be able to experience the outstanding achievements of thousands of high school students participating in Bands of America-sponsored events." BOA Fan Network live Webcasts will kick off this weekend, broadcasting at the St. Louis Super Regional on Oct. 17 and 18 from the Edward Jones Dome. "We are very excited about this collaboration with DCI and Mr. Video and look forward to not only delivering greater content to the end user from the current year's events, but to begin to populate the platform with years worth of archives for our subscribers to watch online," said Music for All President and CEO, Scott McCormick. "We look forward to what will evolve from this relationship and the possibilities that exist across the platforms of all the pageantry arts in the future." Current members of the Drum Corps International Fan Network will be able to join the BOA Fan Network at a discounted rate and will be notified via e-mail with special offers. Learn more about the BOA Fan Network and subscribe today.